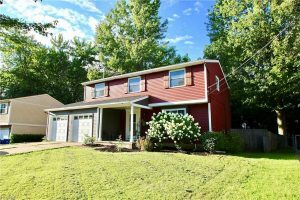 Move right in to this spacious colonial where the main floor living areas boast updated carpet, moldings and paint. Everyone will enjoy cooking in the newly remodeled kitchen featuring new countertops, ceramic tile flooring, a mosaic tile backsplash, white cabinetry and an island for extra prep space.In the upstairs of this home you will find four generous size bedrooms with plenty of closet space and natural light. The first floor is rounded off with a convenient half bath and beautiful sliding glass doors leading out to the backyard. Out back you will enjoy a large, private lot with a wooden privacy fence, spacious deck, fire pit and 14×12 storage shed.